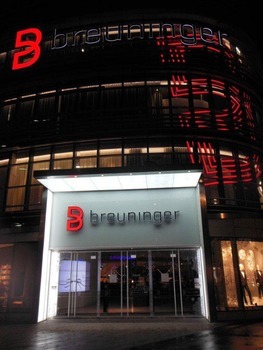 DÜSSELDORF, Germany — German upscale retailer Breuninger recently opened a 172,000-square-foot (916,000 square meters) department store in Düsseldorf, located in the city’s Kö-Bogen downtown office and retail complex. The striking new facility merges glass surfaces, steel, stone and curving, organic shapes with trees that are inset into the sides of the building and a grass roof. Shoppers can peruse Breuninger’s luxury selection of fashion, accessories and premium goods – the shoe department alone has 25,000 pairs for sale – while listening to music courtesy of a HARMAN audio system featuring Crown amplifiers, BSS Audio networking components and JBL Professional loudspeakers. Heilbronn, Germany-based HARMAN distributor Audio Pro Elektroakustik supplied the sound system for all five floors of the massive Breuninger mall. At the heart of the installation are 10 Crown DCi 4|600N and 8|300N networkable power amplifiers, which offer networked monitoring and control using HARMAN HiQnet™ Audio Architect system software and BSS Audio BLU link digital transport. “The new Crown DCi Series amplifiers are ideal for this application because they can be seamlessly networked with the BSS Audio signal processing components, deliver plenty of clean power and can be configured for use in a very large-scale distributed audio system such as the one installed at Breuninger,” said Carsten Peter, Product Manager for Audio Pro Heilbronn. The amplifiers, loudspeakers and entire audio system are networked using a BSS Audio Soundweb London BLU-160 signal processor with digital audio bus and three BLU-BIB break-out box input expanders. Eleven BSS BLU 6 wall-mount controllers and eight BLU 8 wall controllers are located throughout the Breuninger mall. Although they are extremely powerful, the Crown DCi 4|600N and 8|300N amplifiers are just 2U rack spaces high, enabling all of the amplifiers to be installed in one equipment rack, with all the BSS Audio networking components located in an adjoining rack. Covering 172,000 square feet, over 800 JBL loudspeakers were deployed, including approximately 600 JBL Control 24CT in-ceiling loudspeakers, more than 150 Control19CST in-ceiling subwoofers and Control 65P/T full-range pendant loudspeakers. The Crown DCi Series’ compact size, high efficiency and superior sound quality are made possible by HARMAN’s proprietary DriveCore™ amplifier chip, which combines the amplifier driver stage into the power output along with additional audio-signal functions, yet is about the size of a postage stamp. DCi Series amplifiers can be operated into 8-, 4- or 2-ohm loads and offer direct drive “constant voltage” capabilities for 70vrms and 100vrms amplification without the need for a step-up transformer, yielding higher audio quality in distributed audio applications. In addition, the amplifiers incorporate an exclusive Global Power Supply and a universal AC input, enabling their use in any country.